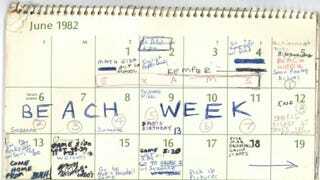 Supreme Court nominee Brett Kavanaugh submitted his 1982 calendar to the Senate Judiciary Committee in a last ditch effort to prove the sexual assault allegation made against him by Christine Blasey Ford are false because..... he never wrote about it on what appears to be a shared calendar? The following entries are from the summer months, when Ford says the incident occurred. It’s almost as if this means absolutely nothing.